Branded by many as one of the worst animated films to pop up in a long time, this year's The Emoji Movie was greeted with naught but hostility from the very second it was announced - and each trailer made it's fate more and more foreseeable. Indeed, reception has been so abysmal that it's box office results are looking as mediocre as anyone would expect and it's reviews so bad that Rotten Tomatoes couldn't even find a way to summarise it...yikes. But is all this negativity really deserve...oh, what's the point. Within the phone of young student Alex (Jake T. Austin) lies Textopolis, a world comprised of the device's numerous apps and texting features and inhabited by the eponymous emoji's, whose roles within society are to simply pose appropriately when Alex utilises them in an SMS message. Though their role seems simple, one emoji, Gene (T.J. Miller), finds himself unable to adopt the preset "meh" persona due to his expressive charisma - something that jeopardizes his future within the city and forces him on a quest to become the emoji society needs him to be. It's as ludicrous as it sounds, I won't lie. The concept isn't one that's automatically terrible - perhaps it'd work well as a silent short film, for example. But the writers are adamant to craft a story with the cliché themes of love, friendship, and being yourself - mix this with a very daft concept and you have an extremely awkward end result. Such awkwardness is then worsened by characters who are massively underdeveloped, forgettable, and frequently irritating; Gene's overall struggle to simply pull a miserable face is a desperate story arc that can't ever be taken seriously, whilst the corny antics of clumsy sidekick Hi-5 (James Corden) painfully blend an already unfunny performer with even less funny jokes, making you want to glue your eyes and ears shut whenever he pops up on screen. There's also a romance in there somewhere between Gene and hacker emoji Jailbreak (Anna Faris), whose backstory was clearly pulled out of the filmmakers' asses at the last minute and who also seems to be capable of overcoming any obstruction with her 1337 hax skills, even if it blatantly contradicts some earlier moments and results in a tonnage of dumb plot holes. 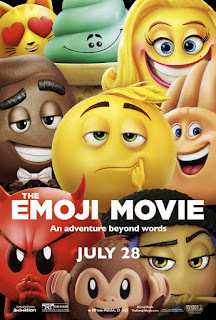 I won't be all negative - The Emoji Movie does have some funny jokes and pop cultural references, and Maya Rudolph's strangely committed performance as the villainous Smiler may generate a few giggles, but these are all built around a generic, soulless narrative that's even less tolerable within such a silly premise. The very young may have fun and will certainly admire the colourful visuals, but everyone else will find their faces colliding with those palms a lot.